J'ai lu cet article et je l'ai trouvé très intéressant. Cet article s'appelle The history of the Shoah Memorial et se trouve à cet adresse http://www.memorialdelashoah.org/en/the-memorial/presentation/the-history-of-the-shoah-memorial.html. The seeds of the Shoah Memorial were planted during the war with the founding of the Centre de documentation Juive Contemporaine (Contemporary Jewish Documentation Center), an archive that collected evidence of anti-Jewish persecution. Later, the Memorial of the Unknown Jewish Martyr was created. Today the Memorial, a museum and archival center, is a place of mediation essential for the transmission of memory. IN 1943, THE GOAL WAS TO DOCUMENT THE PERSECUTION OF THE JEWS. On April 28, 1943, during the occupation of France, Russian-born industrialist Isaac Schneersohn invited 40 activists and representatives of various currents in the Jewish community to the apartment he rented on rue Bizanet in Grenoble to discuss the possibility of creating an important underground archive. As the Nazi occupiers were hunting down Jews with assistance from the Vichy government police, the goal was to set up an organization that would collect evidence of anti-Jewish persecution in order to bear witness and demand justice after the war. Schneersohn may not have been aware of it, but he was laying the groundwork for an international criminal justice system and the Nuremberg trials a few years later. After the meeting, the founders of the archives, now called the Centre de Documentation Juive Contemporaine (Contemporary Jewish Documentation Center, known by its French acronym CDJC), began collecting documents. However, the September 1943 German invasion of the zone in which Grenoble was located, until then occupied by Fascist Italy, put an end to their work. Schneersohn joined the French Resistance in Dordogne, forging contacts that turned out be helpful after the war. After the fighting to liberate France began, Schneersohn and his team went to Paris to prevent the records of the Vichy regime and the Nazi occupiers from being destroyed or being spirited away. Thanks to the intuition of Schneersohn and Léon Poliakov, head of the archives’ research department, and help from the Resistance, the CDJC got its hands on the precious archives of the CGQJ, the Germany embassy in Paris, the German general staff, the Vichy government’s representatives and, above all, the Gestapo’s anti-Jewish department, one of the few recovered in Europe. The story of how they did it is worthy of a Hollywood thriller. No sooner was the war over than the CDJC started processing the archives in order to study the process leading to the destruction of France’s Jews. The center founded its own publishing company, published its earliest research on the internment camps (Joseph Weill, Contribution à l’histoire des camps d’internement dans l’anti-France, Paris, CDJC) and, in 1946, created Le Monde Juif, the first Holocaust history journal. 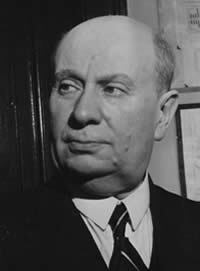 Meanwhile, on behalf of the French government Edgar Faure asked the CDJC to provide French prosecutors with documents that would help them build their case in preparation for the Nuremberg trials. The center had a permanent representation at the international and American trials, becoming an official recipient of all the documents then in circulation. Recognizing the CDJC’s work at Nuremberg, General Prosecutor Telford Taylor allowed Poliakov and Joseph Billig access to the trial’s records. Its role in ensuring that justice would be served, which began at Nuremberg, continued at the trials of Nazis and their henchmen involved in the final solution in Germany, France and Israel, where CDJC research director Georges Wellers was called to testify at the Eichmann trial. In the 1980s, the CDJC provided French prosecutors with key evidence, the Izieu telex, allowing them to charge Klaus Barbie, the former Gestapo head in Lyon, with crimes against humanity. Inauguration of the Memorial of the Unknown Jewish Martyr, 1953. © Mémorial de la Shoah. In 1950, Schneersohn decided to create a memorial-tomb for Holocaust victims: the Memorial of the Unknown Jewish Martyr (MMJI). At first, his idea met with objections from part of the Jewish community, which did not want “an institution looking towards the past”. Schneersohn then set out to create a broad-based sponsorship committee including many prominent figures. 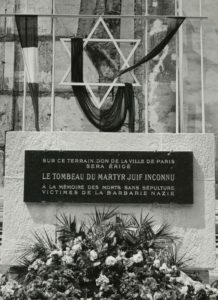 When he turned to David Ben Gurion, the head of the new State of Israel became aware that the first memorial dedicated to the Jewish victims of Nazism was going to be in Paris. That realization prompted him to quickly create Yad Vashem in Jerusalem, with which the CDJC forged close ties. On May 17, 1953, the cornerstone of the Paris memorial was laid on a lot donated by the city. Several countries — France, Belgium, Luxembourg and Yugoslavia — contributed by donating art works. On October 30, 1956, the memorial was inaugurated with 50 Jewish community delegations from around the world and many political and religious figures from across Europe in attendance. On February 24, 1957, Grand Rabbi Jacob Kaplan solemnly deposited ashes from the extermination camps and the Warsaw Ghetto in the memorial’s crypt. Every year, the Memorial of the Unknown Jewish Martyr, a national historic monument since 1991, hosts the main Holocaust commemoration ceremonies [the Warsaw Ghetto, the liberation of Auschwitz, Hazkarah and National Deportation Day] organized by the State or the Jewish community. 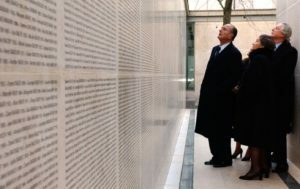 Jacques Chirac and Simone Veil at the Shoah Memorial’s inauguration in 2005. The growth of the Holocaust research center, one of Europe’s first, and the expansion of the Memorial’s activities, especially towards schools, led the Memorial-CDJC Board of Trustees to take a new step: creating the Shoah Memorial. Completed in late 2004, the extension offers more spacious reading rooms, a permanent exhibition on the history of the Holocaust, a multimedia learning center, an auditorium and, outside the building, the “Wall of Names”, on which the names of all the Jews deported from France are engraved. The Shoah Memorial is many things at once: a museum hosting a permanent exhibition, two temporary exhibitions a year and many cultural events (panel discussions, film screenings and testimonies); an archival center open to researchers; and a place of remembrance and the transmission of memory. 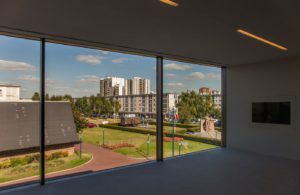 In 2005, the Shoah Memorial opened a museum in Drancy opposite the Cité de la Muette, the former internment camp. A historic place where memory is transmitted, this branch of the Paris Memorial presents the Drancy camp’s history. The Shoah Memorial is active in French regions and abroad. In Toulouse, the regional branch for the South of France relies on local partners and the regional heritage to relay the Memorial’s actions. In 2016, it organized the first Summer University of the South of France for teachers in Toulouse. Since 2009, the Shoah Memorial has had a permanent correspondent in Italy, where it develops three kinds of activities: continuous training, partnerships with Resistance museums and an active presence in universities. In Poland, the Memorial organizes journeys of remembrance and a Summer University. In the United States, it organizes temporary exhibitions with local partners.